The everyday life of a disciple is an adventure. We face hundreds of decisions daily and the right choices are often the most difficult. God calls us to choose the costly life of following Christ. It takes sacrifice and courage. It takes perseverance. We will need robust minds, passionate hearts and active hands as we inch towards our great reward. We do none of this alone. Using the book of James, the teaching at Spring Harvest 2018 explores what it is to live a life of determined discipleship and give a rallying cry to join the everyday adventure that lies ahead. We are discipled to make disciples. We get one chance at this life – let's live it. This USB contains hours of content recorded at Harrogate and serves as an invaluable resource for small groups and individual study. All of the recorded teaching is in video (MP4) format and includes the Morning Bible Teaching and Evening Celebrations featuring Malcolm Duncan, Archbishop John Sentamu, Liz Adekunie, Andy Hawthorne and Anthony Delaney. 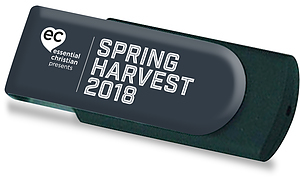 Be the first to review Spring Harvest 2018 Harrogate Video Only The Brave USB! Got a question? No problem! Just click here to ask us about Spring Harvest 2018 Harrogate Video Only The Brave USB.